"This recipe includes directions for making lemon sauce, a perfect complement to a spicy bread pudding." Preheat oven to 350 degrees F (175 degrees C). Spray an 8x11 inch casserole with nonstick spray. In a large bowl, combine bread cubes, 1 cup sugar, salt, cinnamon, and nutmeg. Mix in raisins, if desired. In another bowl, blend milk, melted butter, and eggs. Add wet ingredients to dry, and mix together without turning bread mixture into mush. Pour mixture into prepared casserole dish. Place casserole dish into a larger baking pan. Pour hot water into baking pan about 1/3 up the side of the casserole dish, creating a water bath. Bake for 45 minutes. In a small saucepan, combine 1/2 cup sugar, cornstarch, 1 cup hot water, 2 tablespoons butter, lemon juice, and lemon zest. Cook on medium heat until bubbling and thickened. Stir constantly to avoid scorching. Serve with bread pudding. 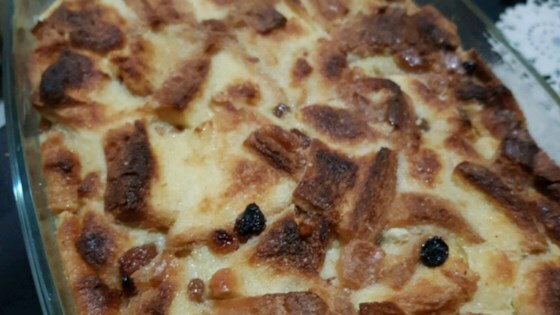 A sensational, old family recipe for rich and delicious bread pudding. The lemon sauce on this one is awesome! I loved it. The bread pudding itself was also great but the lemon sauce was the best. Definitely worth making again. A little to much juice, did not firm, will try again. Delicious! I added a bit of vanilla and it was superb! I will definately keep this recipe and share the joy!! I used day old french bread for this recipe and it turned out great. A delicious, custardy bread pudding. I made it with day old sourdough bread and added the raisins, and that lemon sauce! Deluxe, mmm mmm very tasty.